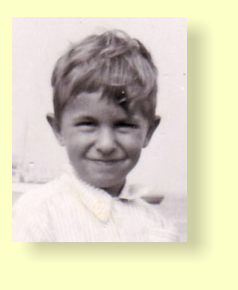 I was born in Gravesend, Kent, England in 1946. I cannot remember when I first badgered my parents for a Meccano set but I must have been about 5 years old, that's me in the picture age five. When Christmas came around I was given a small construction set but to my great disappointment it was not the Meccano set I had long ed for but a poor imitation! The parts were tin and dull zinc plate steel with the same hole spacing as Meccano but the strips were crude, flimsy affairs compared to the glossy green and red Meccano parts I had longed for. The rods and crank handle were of smaller diameter than Meccano but the nuts and bolts were larger than those of Meccano. I still have most of the parts from this set shown right . I have no idea who manufactured it. I do remember it having a very small instruction booklet and the set bringing me a great deal of pleasure. I was determined though to get some real Meccano and used pocket money to purchase, when funds were available, an eclectic assortment of Meccano parts. 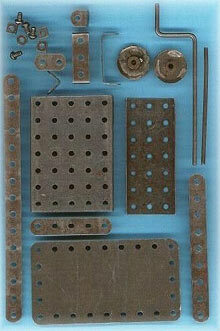 These included two 15 hole braced girders, a boiler and a 25 x 5 hole strip plate. The latter made a great deck for a bridge to carry Dinky Toys over my Hornby train set. Gravesend in the nineteen fifties had three Meccano dealers two of them, W.D. Shaddick and Halfords stocked spare parts, Toy Stores in the High Street the third dealer only sold a few basic sets. The large dealer's cabinet at Shaddick's where parts were kept on a counter upstairs and was presided over by a Lady who had worked in the store since the nineteen thirties, only she knew where all the parts were! It was a rare treat to be allowed to look inside the compartmented pull out trays, boys had to stay at the front! 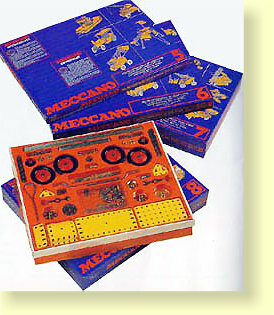 On the front of the cabinet was a large coloured illustration behind a pane of glass showing all the parts in the Meccano range, shown on the right. Picture courtesy of John Thorpe who sells full sized reproduction prints of the board. I do remember sometimes being disappointed because a part I wanted was not in stock and Mum getting impatient as I made up my mind, drooling over the illustrations, as to what other part or parts to choose. The parts were wrapped in brown paper with a label showing the part number or in yellow card boxes. If you bought all the parts left in box you got the box too! 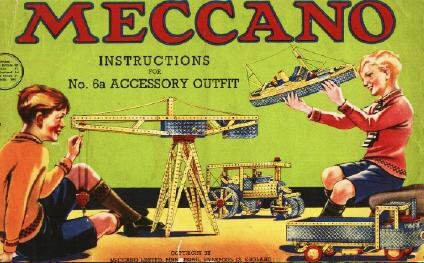 I must have gone on a lot about having a "real Meccano set" because when I was seven or eight, I received for Christmas a second hand pre-war No. 7 set. It consisted of sets 5, 5A and 6A the parts were finished in gold and blue with red wheels and pulleys. Meccano colours that I had never seen before but I was in heaven. No matter about the strange colours, what joys! Shown below is the box label from the 4A set of the same period. I was very disappointed that I could not build the truck and trailer shown on the label but as I found out many years later I needed the number 8 set. I still have most of the parts but nearly all were played with beyond use and I still have too the now very tatty and much used manuals but now have replacements. The blue and gold colour scheme was much maligned by boys when it was introduced, as "being sissy" but it now has a wonderful nostalgic feeling of the thirties. The picture below is the cover illustration from set 6a and is a beautiful example of contemporary graphic art. The van at the top of the page is something similar to one I remember building not long after I received my blue and gold sets whether quite in this form is quite another matter, it was over 60 years ago! This model was built with those same old parts the tyres supplied were originally white but have long since perished. In 2013 I decided it would be fun to recreate the number 7 set and make again some of those pre-war models. I have been collecting the necessary cross hatched blue plates and have stripped and re sprayed all of the gold and red finished parts to make this possible. I have now a web page showing what I have been building with my refurbished Blue and Gold set. The nineteen fifties was an exciting time to be growing up with new aircraft and cars seemingly announced almost every month. Every week there was Dan Dare in the Eagle comic and exciting cut-away drawings in the centre spread showing everything Meccano Boys wanted to know about: how ships, aircraft, tanks diggers and even space ships worked. On the Radio there was Jet Morgan and his crew in "Journey into Space." Every month I looked forward to the Meccano Magazine ordered from my local dealer to see the latest developments from the Meccano Company, new models, mechanisms, ideas, new Dinky Toys and Hornby Dublo Trains. The Meccano Magazine, price one shilling (5p) had to be ordered from the main local Meccano dealer in my case "W. G. Shaddick" of Windmill Street, Gravesend. 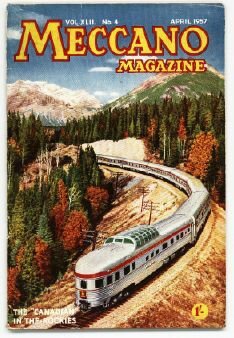 The picture below right is the front cover from, April 1957 Meccano Magazine showing "The Canadian" the trans Canadian train in the Rockies. I got to ride in the dome car in those same stainless steel cars through the Rockies in 2006. One of my favourite features in the Meccano magazine was the "Model of the month" there were brief instructions and photographs published in the magazine. Typed, duplicated and detailed instructions could be obtained free of charge by writing to Meccano Ltd at Binns Road Liverpool. I built the models in the manuals and many of my own designs too. The parts in each set were listed at the back of each manual, making it easy to build up to the next set by purchasing the parts. Most of my childhood pocket money was spent buying those extra parts. One year a Birthday gift was the Gears Outfit "A" the manual cover is shown below, this set was aimed at the owner of sets 0 - 6 these contained few or no gears. I eventually progressed to a No. 9 set plus extra parts, clockwork and electric motors. 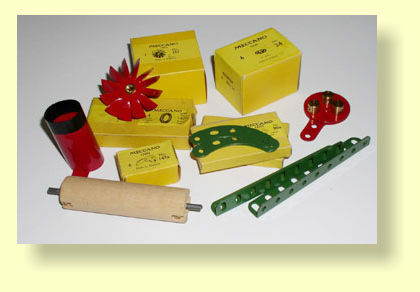 A selection of 1950's parts and packaging is shown below. I also bought sets from some of my less enthusiastic school friends, who were not interested in their Meccano. This helped further boost my collection, but they only ever had small sets. Interestingly I had no thoughts at that time that the parts I bought did not match my original blue and gold set. However I do remember being more disturbed by the change in 1959 to a much lighter red and green as I was building up a nice collection of the earlier mid red and green parts. Legislation had been introduced outlawing the practice of putting lead in the paint used on children's toys. The colour change was to make the difference clear, although all packaging was marked with a capital LF (lead free). 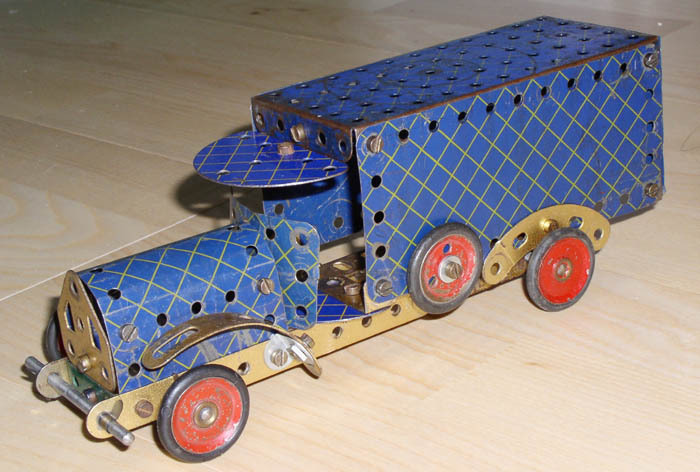 In 1961 my Meccano career was put on hold for many years. It was all put away at the back of the wardrobe after I enrolled as a student at Gravesend School of Art. The last model I built was an attempt to replicate the excavator shown on the cover of the gears set “A " manual, shown on the left . Meccano had always been my favourite toy and I was so glad it was there packed away to be able to rekindle my interest later in life. I also made sure it survived Mum's love of having a "clear out". When I got married it went with me. In the late 1970s I started thinking about my old Meccano again when our two boys were playing with Lego. 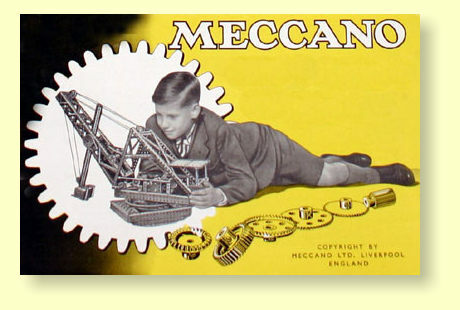 This was at the time the publishers New Cavendish started issuing the"Hornby Companion Series" about the history of products of the Meccano company. I bought volume 1 and volume 2 the Meccano Super Models and this for me opened a whole new interest in Meccano as a hobby. Through a business contact I discovered M.W. Models at Henley-on-Thames, where spare parts could be purchased. I started building the models in the book, at least those I had enough parts for and needed to purchase only a few parts for, hobby budgets being tight with two small boys to bring up. 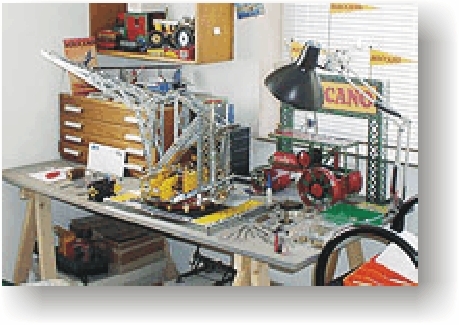 The first model I built was the Single cylinder horizontal steam engine, always a nice simple model to build followed by the gantry crane and other smaller Super Models. My two sons Daniel and Dominic also enjoyed playing with my old Meccano and soon got to enjoy Meccano too. Sets of their own were soon purchased and grew along with them starting with the 1978 blue and yellow sets, the Space 2501, Construction and Army sets were later added. My own Meccano was kept separately. I don't think it had quite the appeal of their new shiny sets. However gloom was on the horizon for all Meccano boys young and old, at 3:30 on Friday, 30 November, 1979, Airfix the owners of the Binns Road factory announced to the workforce it was to close, without further delay. After the closure of Binns Road there was a scramble by enthusiasts to buy the remaining stocks of sets and parts from toy shops. Spare parts soon became almost impossible to get, It looked as though this was the end of an era. I too searched toy and model shops for sets and spare parts for my two sons (plus a few for me). There was a brief time after the closure when the sets sold off by the liquidators became available at knock down prices. In 1980 I picked up several sets including the Space 2501 set , shown above at a model shop near Liverpool Street Station. The basement of the shop was stacked floor to ceiling with sets, this was probably just a small part of the unsold stock following the closure of the factory. All was not lost for the enthusiast partly through the efforts of Geoff Wright at MW models, new parts from France and second hand parts were obtainable. Things slowly improved, French Meccano was under different ownership to the factory in Liverpool and so continued production in Calais the company at that time owned by an American cereal company. 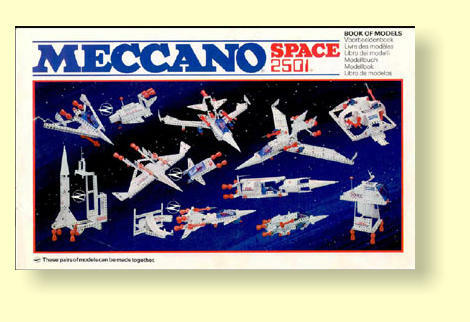 In 1985 they sold the company to a French Meccano enthusiast and accountant Marc Rebibo. For several years under his guidance they produced the 1 - 10 set range as Enthusiasts Sets exactly the same as those sets produced at Binns Road in the early 1970s. My younger son who showed more interest in Meccano than his older brother regularly had these sets purchased for him and built up to a number 9, rather as I had done. I too continued to buy parts too and build models although rather spasmodically. In 1996 I achieved a lifelong dream of owning a number ten set this I bought as an almost unused 1950's red and green No.9 and 9a set from MW Models in Henley-on-Thames*. I later purchased a reproduction Meccano four drawer cabinet to keep my "new" number 10 set in. Since the late nineties my interest in Meccano and building models has really taken off as has my collection of parts including a second number ten outfit in Yellow/zinc/blue. I also have several historic sets from the nickel period and the blue and gold era that I also like to build with. It's nice now to have enough parts not to have to dismantle a model to build another although eventually most do get dismantled. Sometime I just need some of the parts for a new project. I often exhibit my models at Meccano events and put on displays at a local Museum and other events so I like to keep a good range of different types models from different eras built up. It is good to able to have a dedicated Hobby room that I share with Anne my wife. You can view our "Hobby Room" by clicking the picture on the left. 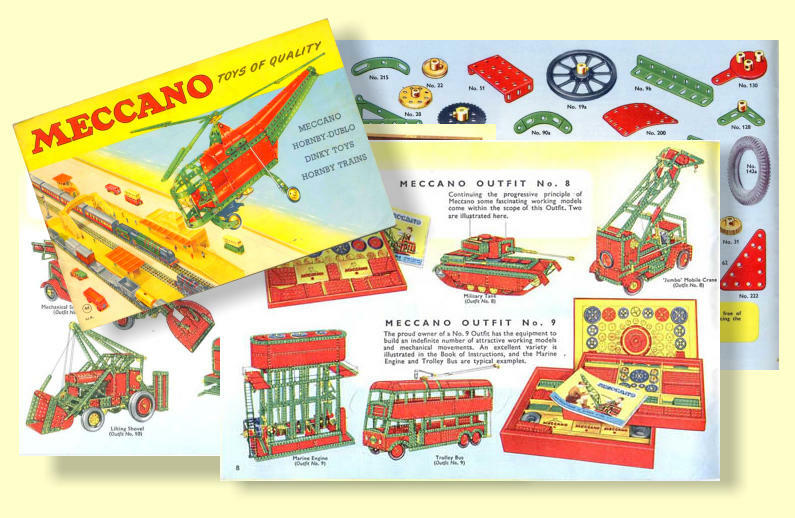 Shown above is a selection of pages from the 1956 Meccano products catalogue and is typical of those of my childhood days. 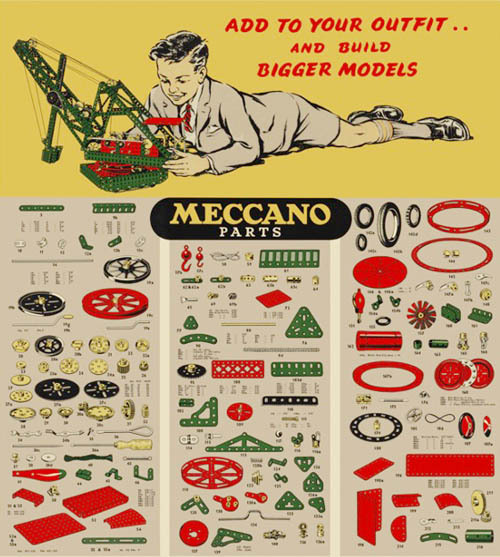 This catalogue was produced around the time of the introduction of new parts and manuals and was probably the heyday for Meccano in the post war period. The helicopter is a model from the number 1954 Number 5 manual. You can see the Loading shovel built 1997 Marine Engine built 2007 and the Jumbo Crane built 2011 in my Gallery of Meccano Models. 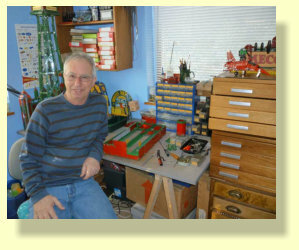 Shown above is my Grandson Timothy aged three and half at the time of the picture adjusting a Meccano robot I made for him in my Meccano room. Another generation of Meccano enthusiast perhaps like his Dad and Grandpa? Through these organisations and my own web site I have made many new friends around the world. I consider myself to be a relaxed enthusiast using whenever possible the parts in the Meccano system both old and new. I enjoy the most building from plans old and new, changing and/or improving them. I am certainly not in the upper league of Meccano constructors making very complicated mechanisms and mega constructions. I do not own a vast collection of parts, although Anne my wife would not agree with this statement. 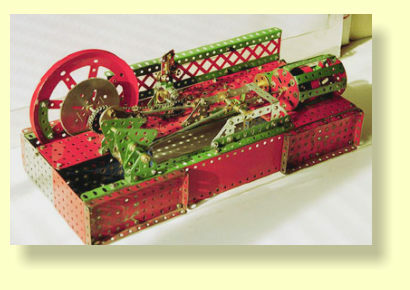 You can see what I have been built in my Gallery of Meccano Models. * M.W. Models shop closed for the final time in March 2003 but the name continues under new ownership selling Meccano related literature in printed and electronic form through the Internet. MW Mail Order The instructions for many of the models shown on my web pages can be purchased there.